30 x sheets of washi paper (15 patterned and 15 plain). This type of Japanese paper is probably best known for its use in origami, the traditional Japanese art of folding paper into various shapes - birds, animals, flowers and many other things - without using scissors or paste. 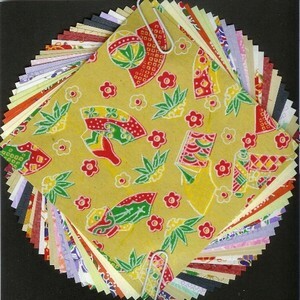 These papers, many with patterns based on kimono textile designs, are ideal for decorating boxes. Patterns and colours vary. Made in Japan. Each image 2, 3 and 4 show examples of 4 patterned/plain sheets.